Families with football players in their midst take note, New Orleans Saints quarterback Drew Brees will bring his first football academy, the Drew Brees Passing Academy and Tournament for high school players, to the ESPN Wide World of Sports Complex at Walt Disney World Resort. Brees, who visited Walt Disney World after winning the super bowl, will help make dreams come true for aspiring players during the camp. The prestigious four-day academy, which is open to all skill levels but is expected to attract some of the most highly-ranked high school players in America from June 27-30, will involve elite-level instruction from Brees and other marquee NFL players and coaches. The academy participants will learn insider tips related to virtually every facet of the passing game, from the proper throwing motion to throwing on the run to taking command of the huddle, from one of the NFL’s elite quarterbacks. The academy is the latest collaboration between Brees and Disney. In 2010, Brees appeared in the famous “I’m Going to Disney World” commercial and Super Bowl parade at Walt Disney World following the Saints’ championship win over the Colts. 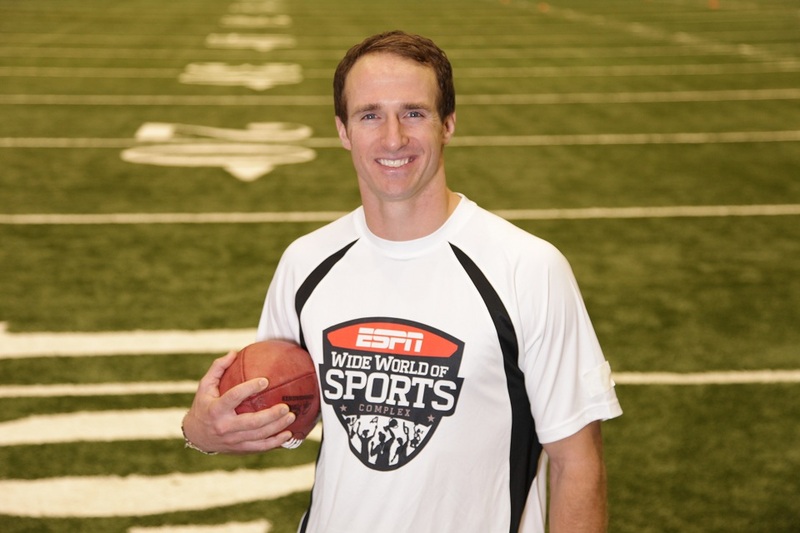 In 2011, Brees acted as spokesman for Walt Disney World during the week of Super Bowl XLV in Dallas, Texas. If you watched the Super Bowl tonight you saw a hard fought game between two deserving teams. But one team had destiny on their side, and a city on their backs. That team was the New Orleans Saints the champions of Super Bowl XLIV. Brees’s pronouncement, part of the production for one of TV’s most enduring and celebrated commercials, was captured after the Saints’ 31-17 victory over the Indianapolis Colts – a game during which he earned the MVP honor, completing a Super Bowl record-tying 32 passes for 288 yards and two touchdowns. He was 16-for-17 in the second half, twice leading the Saints from behind. It added up to be a catalyst for the Saints’ first Super Bowl celebration in team history. 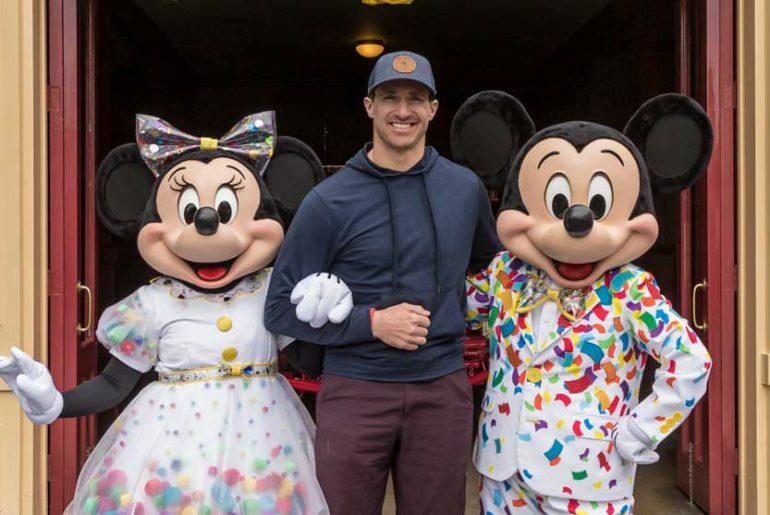 On Monday (Feb. 8), Brees is scheduled to go to the place where millions of vacationers celebrate their personal milestone moments – Walt Disney World Resort. He is to be joined in the Magic Kingdom by NFL Youth Football players, who will participate with the Saints star in a Super Bowl celebration parade down Main Street, U.S.A. The parade is scheduled for 11:55 a.m. at the Magic Kingdom. This latest commercial is the 42nd of a series that began in 1987 following Super Bowl XXI. 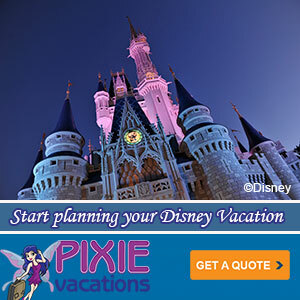 The first “I’m going to Disney World” commercial, featuring New York Giants quarterback Phil Simms, was regarded as a groundbreaking concept – a produced national commercial involving a current event, airing on major networks within hours of its conclusion. Brees joins a lineup of people from sports and beyond who have celebrated milestone accomplishments in “I’m going to Disney World” commercials.